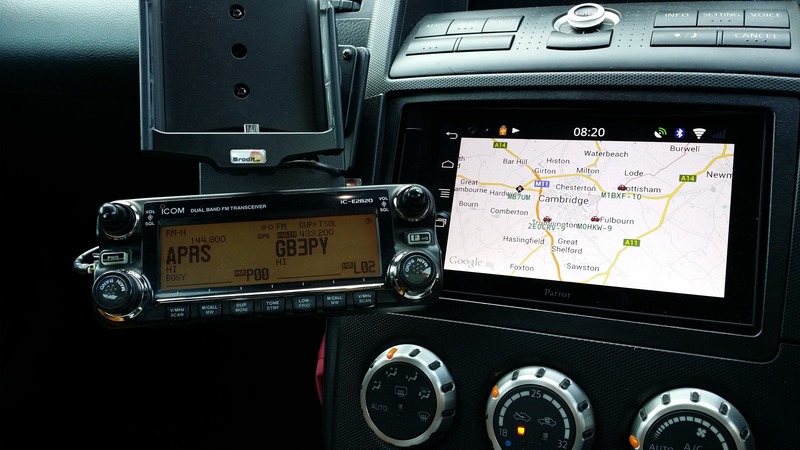 In my car I use an Icom IC-2820 which is a dual band (dual receive) mobile radio, but only ever monitor one side at a time (the other side has the volume down) and in the previous car I used that side for APRS. 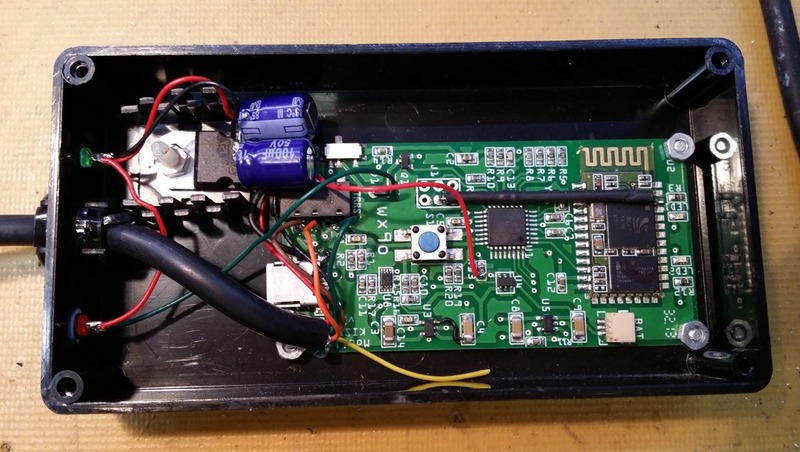 Until recently I was not able to find a way to auto power on/off an APRS tracker with the ignition so I never did setup APRS on the radio, that was until I modded the Icom IC-2820 to provide a switched DC output on the packet port. After travelling with a friend who has a TM-710 in their car and seeing how useful knowing another stations distance and bearing from you I decided when I got APRS running again I would like to see this info, preferably on a map. 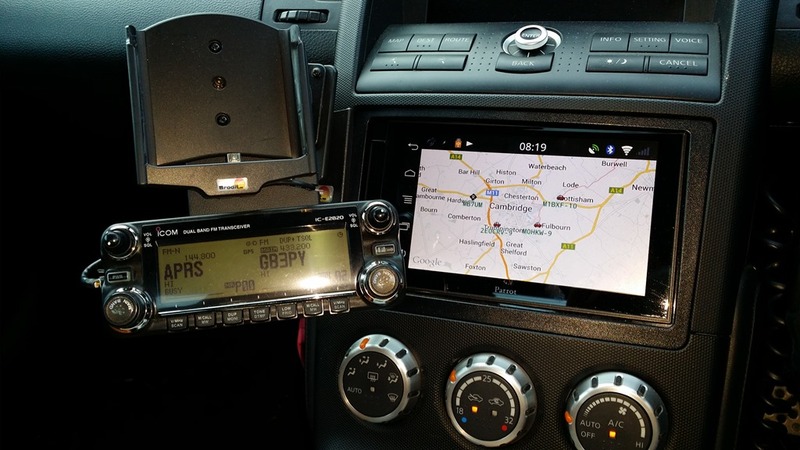 I could of course go and buy a Kenwood TMD-710 or Yaesu FTM-350 (or similar models) but I already have a Parrot ASTEROID SMART Android head unit and that has APRSDroid installed which can show APRS stations. Before I started this project there was no connection between the radio and my Parrot head unit ** running APRSDroid so I configured APRSDroid to connect directly to the APRS-IS network over a cellular connection, but this is not radio and local stations will not receive my beacon via RF. APRSDroid supports many interface options, including support for a Bluetooth TNC. 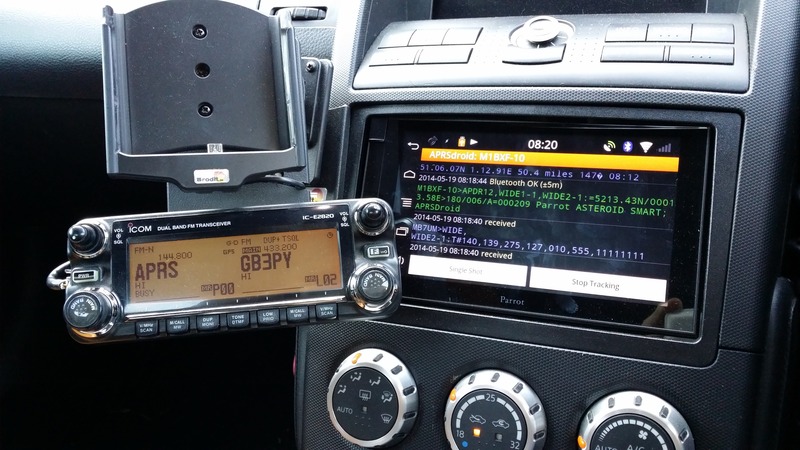 ** The Parrot head unit has an audio line in connection, it would be an interesting experiment to see if APRSDroid could use this input to decode packets heard via RF. A quick Google provided me a link to Mobilinkd Bluetooth TNC, which is a battery powered packet TNC which had a $10 discount (I bought it from the US in May 2014). It arrived within a week of ordering and on arrival the obligatory look inside was called for, where’s my screwdriver? The units used to come in a heat shrink ‘case’ but it now comes in a custom 3D printed box, how cool! Before I jump into the details, here are some pictures taken after the installing the Mobilinkd Bluetooth TNC and running it with APRSDroid on the Parrot Asteroid SMART. Before I got to the install, I found there was going to be an issue for my use, let me explain; the Mobilinkd Bluetooth TNC is designed for hand portables and so is battery powered with the power on/off being a momentary push-button switch, this would be of little use for use in the car as if the battery went flat it would not automatically power back up when the charger, via a mini-USB connector, was connected. This design though is perfect for those wanting to use it with a handheld. What is also great is that the team behind the Mobilinkd Bluetooth TNC encourage “hacking” and so everything is open source and the schematic is available to download. Having a look at the schematic it shows the use of a TC-1185 regulator to produce the required 3.3v for the main circuit, this regulator has an enable input which when high (same as VIN) enables the regulator output. Another chip, a NL27WZ00 Dual 2-Input NAND Gate where the power button is part of, generates this enable voltage. All my mod does is tie the TC-1185 enable input pin (PIN3) to the VIN pin (PIN1) so the regulated 3.3v to the main circuit is on automatically and permanently when VIN (5v) is supplied to TC-1185 regulator. Now that the power would be permanently on when voltage was on VIN, here is no point having the battery connected so I disconnected that. I now power the Mobilinkd Bluetooth TNC from an external 5v regulated source as the on-board TC-1185 3.3v regulator can only handle 6.5v maximum meaning I can’t connect it to 12v directly. With external power and the auto-power up modification I have a method of controlling the on/off power state of the TNC without having to press the power button on the TNC. It’s worth stating the Mobilinkd Bluetooth TNC draws about 160mA initially on power up which means the smaller 78L05 which comes in a TO-92 package is not a suitable regulator as it is only rated to 100mA. After a few seconds the current draw drops to around 55mA in RX. 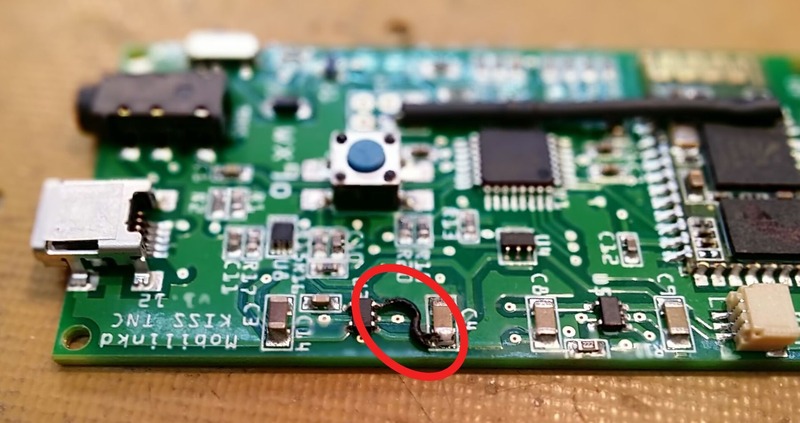 This image shows the points on the PCB, R13, where I connected the 5v regulated input and the connector on where to remove the battery from the circuit. So as mentioned above the Mobilinkd Bluetooth TNC comes in an awesome 3D printed box but as it’s custom printed to the exact dimensions of the PCB and battery I decided to move the PCB to a larger box to make these changes easier. There should have been space for the LM7805 in the 3D printed box if I had removed the battery, but there would be little space for the connecting wires, and as this is a prototype project, having space makes it easier. 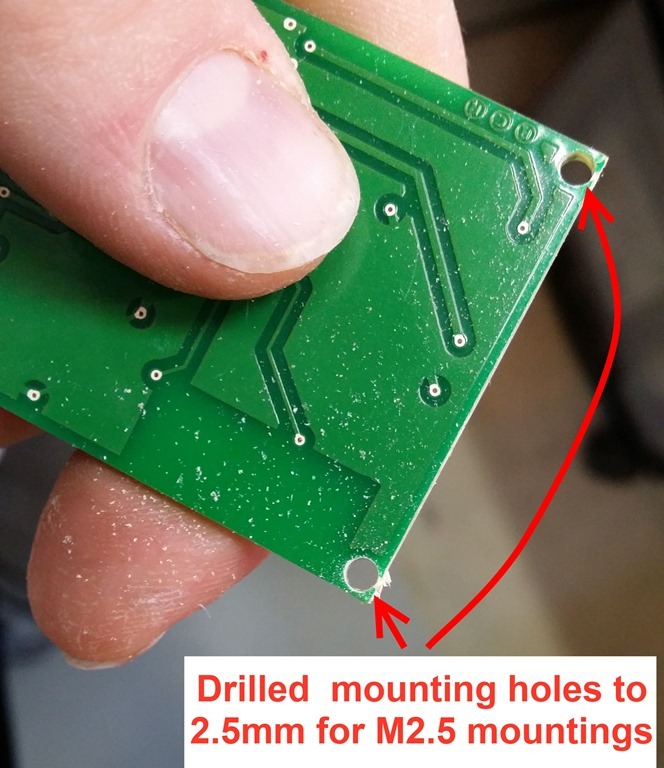 First off the PCB was mounted in the box, this required drilling holes in the box to match the PCB and to accommodate M2.5 mounting hardware enlarging the mounting holes on the PCB to 2.5mm. Once the PCB was fitted the LM7805 regulator was mounted with a little heatsink. The cable exiting on the left is a PS/2 (6 pin mini-DIN) which plugs directly into the radio packet port. I will use this on my IC-2820 in the car and as I’ve now modded my IC-2820 to provide a switched 12v line on the packet port, and with the automatic U3 power on mod above, the Mobilinkd Bluetooth TNC switches on and off with the power button on the IC-2820. I also added a couple of additional LEDs to the box so I could see the state of the power and PTT (from a hardware point). 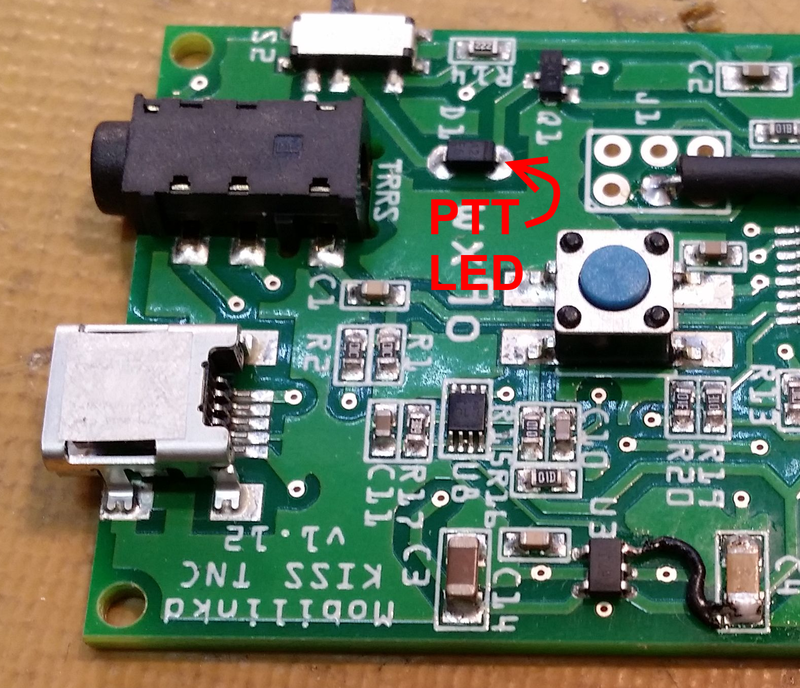 The PTT LED is not standard on the Mobilinkd Bluetooth TNC, which is slightly annoying, but it is easy to add. I should point out I use 5v LEDs to save adding current limiting resistors on my projects. 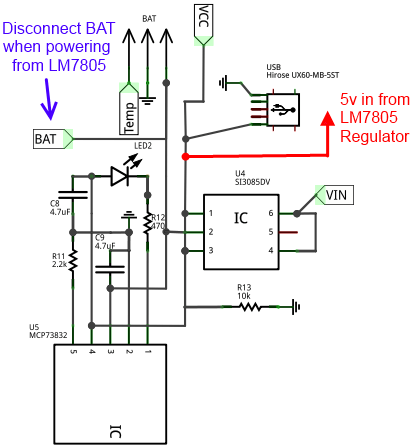 The power LED is simply connected between the 5v regulated output from the LM7805 and ground. The PTT LEDs cathode needs to connect to the point between Q1 and D1 which goes to ground on transmit. 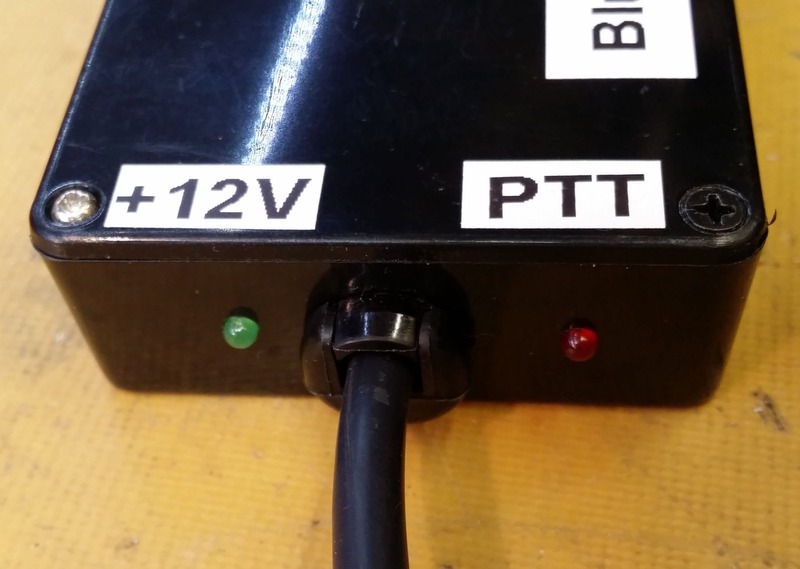 This means with the PTT LED anode permanently connected to VIN (5v) the PTT LED will illuminate when Q1 is enabled. 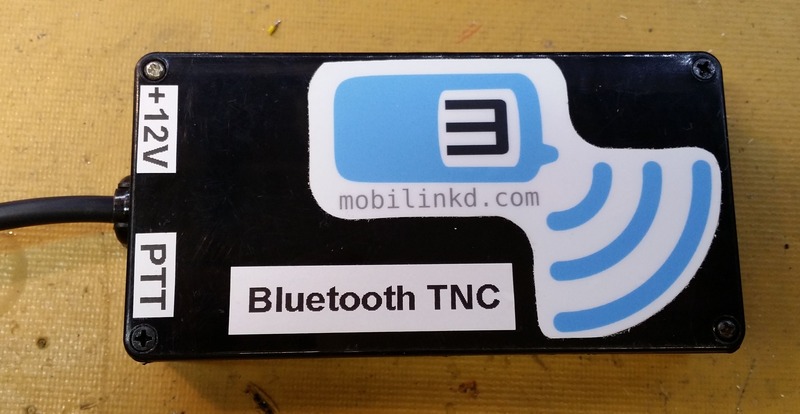 In doing this project I found the Mobilinkd Bluetooth TNC could be slightly improved and become much more universal, especially to mobile users and not just portable users, with a few simple changes. In position 1 on one pole of the switch: connects VIN (Pin 1) to ENABLE (Pin 3) on IC U3. In position 2 on the other pole of the switch: disconnects the battery (BAT) from the circuit. A hardware PTT LED on the PCB which would be useful for setup and diagnosing issues. I’d suggest having a link (0R?) 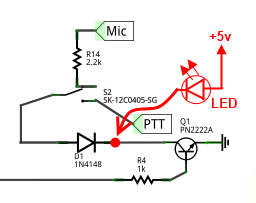 to allow removing the LED from the circuit to save current if the user desired it. 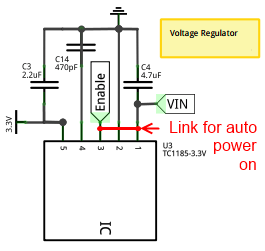 A 3.3v regulator to allow upto +15v on the mini USB port for external power, the current TC-1185 3.3v regulator only supports upto 6v such as a TI LP2925 which is the same package and pinout (including enable support) but supports upto 16v. However the TI LP2925 has a much higher quiescent current than the TC-1185 which is less desirable when used on the battery (perhaps there is a device available which can handle 16v with a with a low quiescent current). Point 2 might be achieved with an SPDT switch which has VIN on the common connection, BATT on one side and ENABLE on the other, but this would need testing. With the Mobilinkd Bluetooth TNC bring in a car for a while now I’ve very very happy with the results. initially I had issues with decoding packets, but never being heard as the digipeater, but after updating the local MB7UM digipeater to a Raspberry Pi + TNC-Pi decoding packets is much better so this was not an issue with the Mobilinkd Bluetooth TNC. 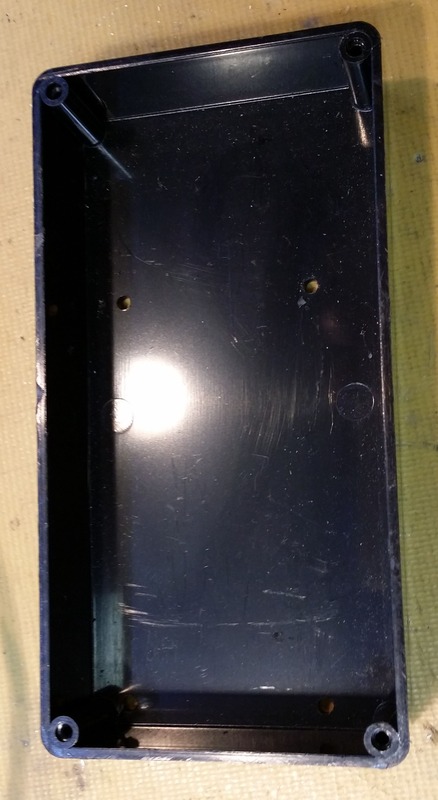 Since the original article I’ve done a small change, which was re-fitting the battery. I realised there may be times where I might want to used the Mobilinkd Bluetooth TNC out and about so I fitted the battery back in. I wrapped it in a bit of foam to stop it rattling in the box. The only issue with doing this is with the auto power on mod the TNC would stay powered up all the time so I had to mod the PCB and add a switch on the side which switched the battery in and out of circuit which acts as a power switch when on battery power. I also added a diode between the LM7805 regulator and the PCB for good measure. Please let me know if you find this article useful. I like the TI part. That should work well. If I need a discrete Vreg in my next revision, I may well use it. One of the options I have been eyeing, however, is an MCU with a built-in Vreg to reduce part count and expense. I think that for #1 and #2 just changing the on/off circuitry to be “initially on” rather than “initially off” would provide the behavior you are after. I have that on the list of changes for the next revision. Most folks would never notice the change. Only those that remove the battery and have the TNC externally powered would notice. I’m not keen on adding another LED. My mantra has been “reduce part count.” However, I have been playing with a multi-color LED and trying out different color & blink patterns. I am not entirely convinced that there is much diagnostic relevance provided by a PTT LED. Thanks for the reply! and fine on the PTT LED. I had an issue with miss-wiring to start with and it wasn’t sure were the issue lay, it was hard to hold a multimeter to Q81 waiting for TX 🙂 but I guess that has to be weight up against the component count, which for such a cool project is a high design criteria. Just a quick follow up on the TI VReg suggestion. Looking at this in more detail, the TI part actually draws a lot of current itself — 0.85mA. That’s a lot of current compared to the 50uA for the Microchip part. We need all the efficiency we can get for our battery powered device. Additionally, all of the other components that run off of VIN (the on/off circuitry & battery charging IC) would have to be changed to accept higher voltage. In the end, it seems it would be more economical to buy an inexpensive car USB adapter and use the VIN via USB. I think they are £2 these days. That’s a fair assessment and understandable conclusion. I’ll admit I hadn’t looked at the device characteristics in detail but from a battery powered device 50uA is much much better than 0.85mA. Thanks for the updated on this. My Mobilinkd Bluetooth TNC is still working great in the car.